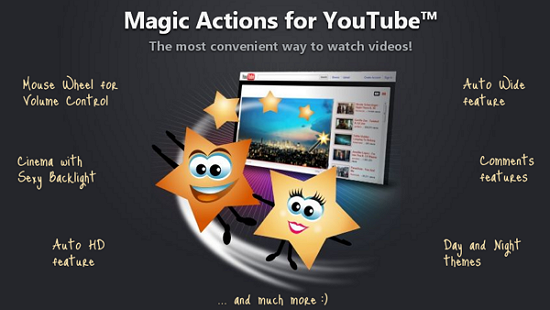 There are hundreds of browser extension available for YouTube to bring some additional features. Here the simple but superb extension brings lot of missing features for YouTube to make better viewing performance. The All-in-One browser extension brings more than 20 useful features for YouTube including AutoHD, Ad Block, Cinema mode, 1 click snapshot, Custom Themes, Scroll Volume Control and more. Cinema Mode - This extension shades the whole page with 1 click on the Cinema Mode button. So users can get better viewing performance on the site. 1-click snapshot - When you watching video you can take snapshot of particular seen just a click. And you can save it different formats like PNG, JPEG or WEBP. You can view and delete your watching history on the YouTube to protect your privacy. Auto hide Player Controls - video controls will automatically hide after a video begins playing. Display user info in comments including country flags. Ability to hide comments, related videos, and more. Magic Actions browser extension available for Chrome, Firefox and Opera web browsers.